يقع في سارفرس باراديس, Focus Apartments إنه المكان الأنسب لاكتشاف جولد كوست و ما يحيطها. يمكن من هنا للضيوف الاستمتاع بسهولة الوصول إلى كل ما تقدمه هذه المدينة النابضة بالحياة. يضفي محيط الفندق اللطيف وقربه من King Tutts Putt Put, Slingshot Gold Coast, Adrenalin Park سحراً خاصاً على هذا الفندق. إن الخدمات التي يقدمها Focus Apartments تضمن للنزلاء إقامة مريحة. يقدم هذا الفندق العديد من الخدمات الكفيلة بإرضاء أكثر الضيوف تطلباً. بالإضافة لهذا,تتضمن كل غرف الضيوف مجموعة واسعة من وسائل الراحة . بعض الغرف توفر حتى تلفزيون بشاشة مسطحة, غرف لغير المدخنين, تدفئة, خدمة الإيقاظ, شرفة/ تراس لإرضاء أكثر الضيوف تطلباً. سواء كنت من محبي الرياضة أو كنت تتطلع لتفريغ عناء نهار صعب، ستجد خدمات ذات مستوى عالي بانتظارك كمثل مركز للياقة البدنية, ساونا, مسار جولف - ضمن 3 كم, حمام سباحة خارجي, حمام سباحة داخلي. يشكل Focus Apartments بخدماته الراقية وموقعه الممتاز، قاعدة مثالية للاستمتاع بإقامتك في جولد كوست. يتوفر انتظار السيارات للسيارات التي يقل ارتفاعها عن 1.8 متر فقط. Good View,good location!Cleaning and comfortable. No dramas, as others have said the Wifi is pretty ordinary. Actually very ordinary, we couldn't get it to work in the time we were there. But the location is fantastic and value for money is great. 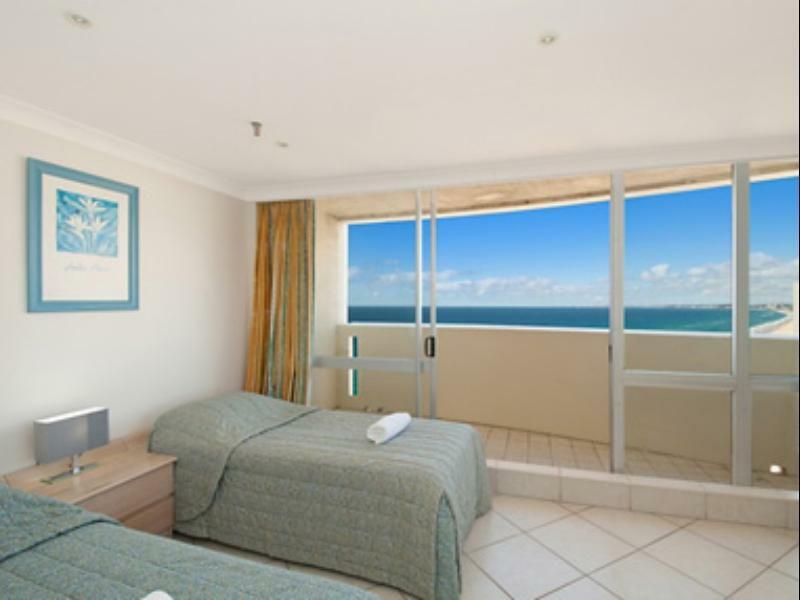 Just far enough from the Surfers Paradise filth but close to the beach. Looks like we've found a new place to stay every trip, perfect for families. Stay - Very happy and lucky to be allocated a sea-facing apartment on the 28th floor! Fantastic view! Felt good to just listen to the waves and watch the people go by on the street/beach. Apartment itself was very spacious, a little tired (it's been around for about 30+ years now!) but everything was clean and in good working condition. 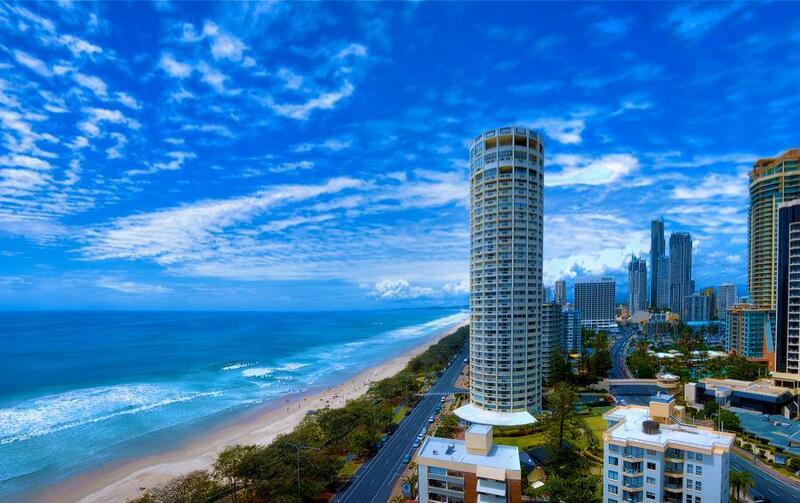 Location - short walk to the heart of Surfers Paradise. Service - Staff were very kind to initiate and inform about late check-in details. Overall, would stay here again if I'm in the GC area! Excellent apartment with full facilities and very clean. The owner was so kind and allowed us to check in early. We like this apartment so much especially the kids. Great location and we had a beautiful renovated apartment with air conditioning - we were very lucky. Being solid brick it was quiet. The views were amazing. The gym needs free weights and better quality equipment (I would not be happy paying the BC fees for the equipment it has. It also needs to be double size - no need for indoor table tennis. The tennis net was low so not suitable for our serious players but fine for little kids and the pool was fantastic - better than appeared in photos. The patrolled beach 100 m south is better than the patrolled beach across the road as the waves break further out so give you a longer ride. The apartment was clean and comfortable with everything we needed, and the staff went out of their way to help us right from the time of booking. The location is to die for..
We stayed in a 3-bedroomed apartment on the 19th floor. We had fantastic views from FIVE balconies in our apartment. As the building is circular, you get great views from all apartments. The staff were excellent, from the ladies on reception, to the friendly night manager, and all the security staff. 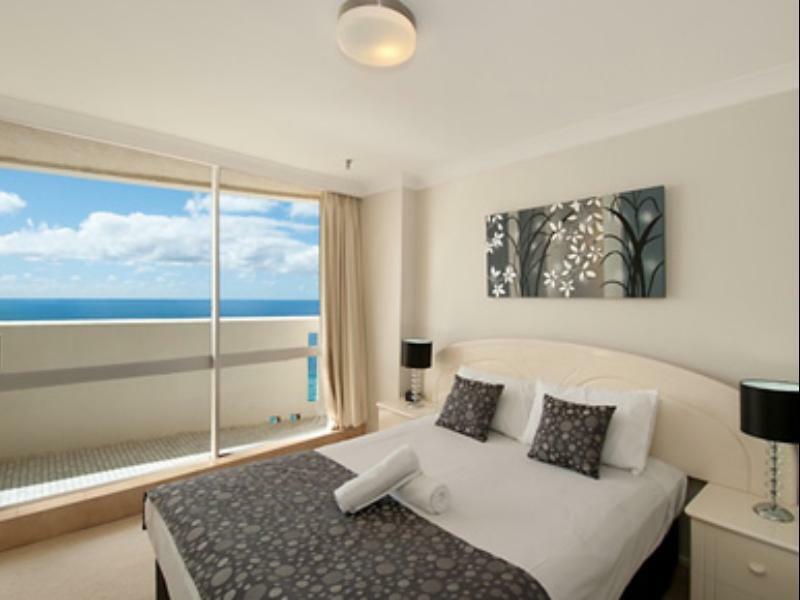 The building is only about ten minutes walk to Cavill Ave, and right across the road from the lovely beach. The grounds are great, with a nice pool, kids pool, and spa. The description of the property does state there is an indoor pool, however this is incorrect. There is a sauna, a gym and a nice outdoor BBQ area. The apartment we stayed in was a little dated. The furniture could do with an upgrade, however the beds were very comfortable. We had two air conditioners. The one in the lounge looked new but didn't function correctly. The one in the main bedroom worked well, however it dripped lots of water onto the carpet constantly, and the outdoor unit was so rusty it looked like it would fall to pieces if we touched it! The main bathroom had a spa bath installed, however the jets didn't work, so it was just a big bath in reality. Every apartment is issued with a parking spot underneath the building, and each bay has a garage door so you can secure your vehicle. Some garage doors were up and overs, and some were roller doors. Our bay had a roller door that was not wound tightly, and hung so low that we couldn't get our car into the bay so we had to leave our car in the guest car park every day. We did have a lovely time though, despite these small annoyances, and wouldn't hesitate in recommending these apartments. There is a seafood restaurant at the bottom of the apartments, however we would never have eaten in there because the tanks of lobsters and fish that were on full view from the window were disgusting, and didn't entice us inside. We as a family of two adults and two children were very happy staying at Focus apartment. The apartment was spacious, clean, and there were balconies in almost every room with great views. Also the location is a bonus. 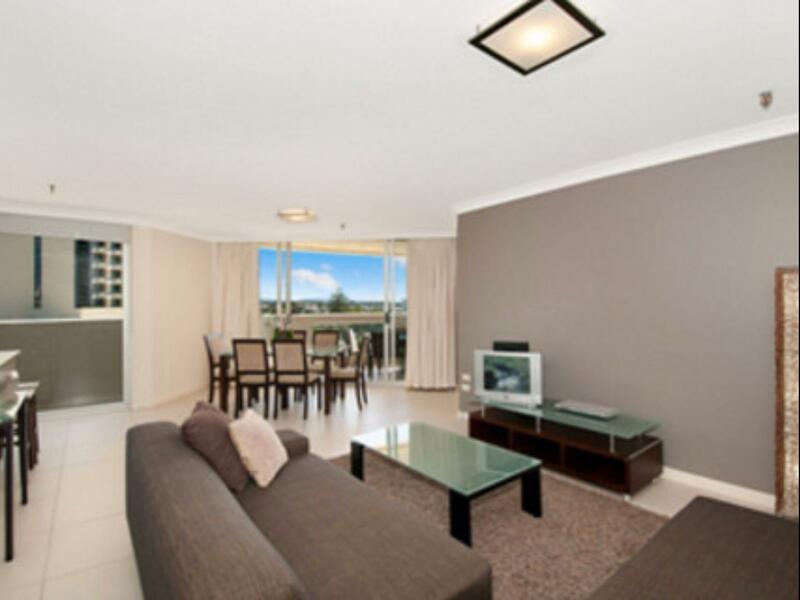 Only short 5 minutes stroll to Cavill Avenue. Bit rough having to park down in the lower basement, when the lift stops at the upper basement, and having to drag bags etc up the ramp. Asked for sea front facing unit but got partial sea facing. TV does not work. Was asked to leave at 10:00 AM sharp however was not pressurized. Bathroom doors should have locks especially if there is couples living in two bedroom unit. Staff was very friendly and helpful. Nice room , nice location!! Really bad experience and worst apartment. The room is dirty and far from the city. $1 extra if you want to have toilet roll and we have 6 people in apartment has only 2 toilet rolls for 3 nights. You can get better apartmnet elsewhere. Very comfortable - would stay there again.